After the various high rating fantasy series, GMA network prided itself as the first network to have a ‘BayaniSerye’ entitled as ‘Ilustrado’ featuring not only the known life and works of Jose Rizal but also his private life. Set to debut on Philippine TV on October 20, Kapuso Network had dropped hints as to what the plot and the series itself promises the viewers. Together in the cast with Alden Richards as Jose Rizal are stars Solenn Heusaff as one of Rizal’s love interest Nellie Boustead, Eula Valdez as the national hero’s beloved mother Doña Lolay, and Kylie Padilla as Leonora Rivera, the said first love of Rizal. It was last September when Kapuso Network released the pictures of the Illustrado photoshoot. The photos showed the look of Alden Richards dressed as the historical Illustrado and our national hero Dr. Jose Rizal. GMA news also shared that the story of the series would mainly show the unknown side of Rizal’s life. Together in the photoshoot with Richards are his co-stars and leading ladies Heusaff and Padilla. Other actors to join the main cast as the villains are Jaclyn Jose as Conchita and Polo Ravales as Venchito. 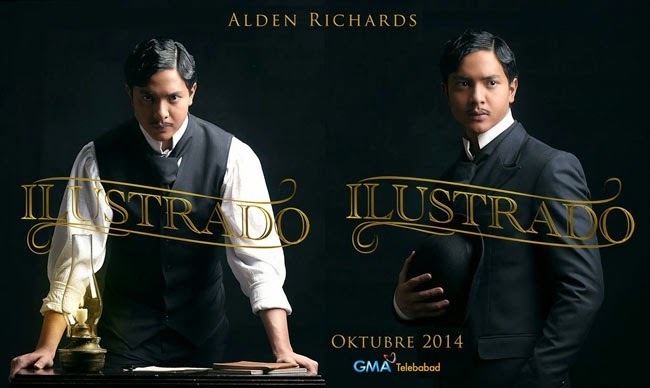 GMA also gave a short sample of the series’ theme song in their official ‘Ilustrado’ Facebook page. Ilustrado is currently a big project under GMA Network and video of various Kapuso stars inviting people to watch the first ever BayaniSerye were posted by the network.